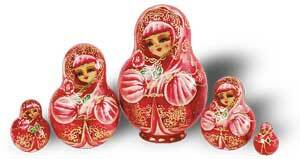 These five languishing Matryoshka sisters in dark rose were also born in Sergiev Posad, one of the famous centres of Matryoshka manufacture. Aren’t they irresistibly enticing? Height - 12 cm. Weight - 0,2 kg.